While this web site will help you to get to know Horace Mann School, nothing compares to a visit to our campus. Taking a tour, talking with students and faculty members, seeing classes and activities in action will all give you a sense of the excitement and energy that fills the school. 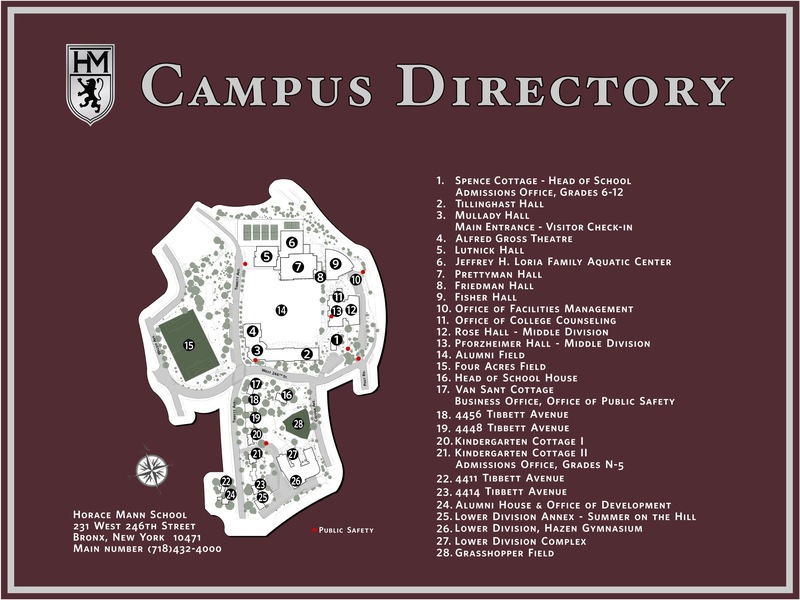 If you can't come to campus sometime soon, check out our campus map. We hope that you will have the opportunity to come spend some time with us. We look forward to seeing you on campus soon! Each fall we host several open houses, typically on weekends in September, October and early November, in order to give families the opportunity to tour the campus and hear from various administrators and current students. Families will also have the opportunity to get a tour during the school day on the date of their interview from one of our student ambassadors. The dates of our Middle & Upper Divisions Fall Open Houses are posted below. Please click onto the date you are interested in attending in order to RSVP for one of the events. You may also call the admissions office at 718-432-4100 to RSVP. We look forward to meeting your family. Sunday, September 23rd, 2018: 1:00 P.M.
Sunday, October 14th, 2018: 1:00 P.M.
Saturday, November 3rd, 2018: 2:00 P.M.
Each spring we host tours, led by our current students, during school hours from early April through mid-May. Please call 718-432-4100 to schedule an appointment.